Canadian Transit Authority Introduces Low-End Wearable for Closed-Loop Payments | NFC Times – Near Field Communication and all contactless technology. Vancouver-area transit authority TransLink is introducing low-end wearables for its closed-loop Compass Card service, providing more evidence that the agency, which launched open-loop fare collection last May, does not plan to phase out the closed-loop card. 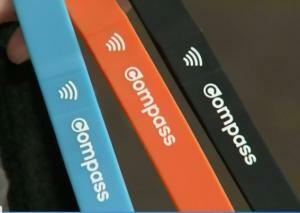 Now TransLink has introduced, in limited quantities, a simple silicone bracelet embedded with a passive contactless chip loaded with the agency’s closed-loop Compass card applet. The wristband would provide an alternative to smartwatches that can be used to pay for fares with contactless credit cards or credit card credentials in NFC-enabled wallets. A recent report says that TransLink is only making a total of 3,000 bracelets available next week for customers to buy at one station on TransLink’s SkyTrain service. They have to put down a CA$6 (US$4.51) deposit for the bracelet, just as they do for the Compass Card. And one-third of those bracelets are reportedly reserved for TransLink staffers. Article has about 670 words.